Last month we had two full moons, the second one on the 31st – and as the Moon takes twenty nine and a half days to orbit the Earth, well, you can work out the consequences for February. Venus has popped out from behind the Sun now and will get higher in the sky as the days go by. Look for it immediately after sunset, chasing the Sun away. A day-old crescent Moon is close by on the 16th but they set very quickly so a good view of the south western horizon will be needed. As soon as it gets properly dark, we start to see one of the most enigmatic objects in the sky but you may have to adapt your vision. Let’s have a look at what I’m on about. When you first step outside from a brightly-lit room, you can hardly see any stars so you need to give your eyes a little time to adjust. In fact, it can take twenty minutes or more for your eyes to properly dark-adapt and the process can be reset if you look at car headlights or some such. Red lights aren’t so bad, though, which is why astronomers use red torches and submarines have red lights in their control rooms. Now, with your freshly-adapted eyes, look high in the south and with the giant constellation of Orion just to the left, Taurus is visible as a “vee” of stars, with Aldebaran shining like a single bright eye looking down on us. 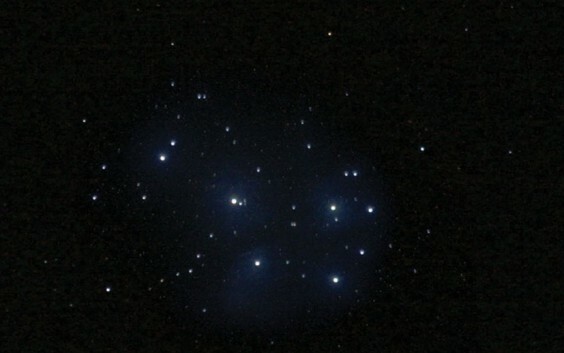 To the right is the lovely cluster of blue-tinted stars that form the Pleiades or Seven Sisters (above). These can form a bit of an eyesight test. How many stars can you see? Sky conditions and how dark-adapted you are can make a difference, as can age. I can see about three! Now, if you look back at Aldebaran but notice the Pleiades out of the corner of your eye, something strange happens. Our cluster of stars appears to be sitting in a little cloud. Look directly at them and they are clear, perhaps with a little fuzziness around. This process of looking at something slightly off-centre is called averted vision and can be used to observe a few objects in the night sky. The nebula surrounding the Pleiades is the cloud of dust and gas from which the stars formed a mere four hundred million years ago. Being so young, the stars are very hot, which gives them their bluish hue. Looking back at Taurus, there is a faint cluster of stars, the Hyades, surrounding Aldebaran. This star is quite the opposite of the Seven Sisters – being quite old and having burned most of its hydrogen, it is turning into a red giant. On the 23rd of the month, the Moon passes in front of it. The process starts in daylight but as soon as the sky starts to darken, just after five thirty, you may just be able to see Aldebaran pop out from the bright side of the Moon. The only way to find out is to have a look.